Spinal fusion is a very common procedure today to treat spine and spine related pain and dysfunction. While the field of spinal surgery has come a long way and their advances have resulted in better long term outcomes, one thing still remains the same, the long term cost of a spinal fusion can be great. A very common problem with the spinal fusion is degeneration at segments above or below the fusion site. It is a problem we have seen time and time again and a recent paper highlights the issue. 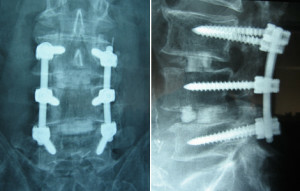 This paper titled, Long-term Follow-up Suggests Spinal Fusion Is Associated With Increased Adjacent Segment Disc Degeneration but Without Influence on Clinical Outcome, won an International Society for the Study of the Lumbar Spine prize and was published in the August 2014 issue of the journal Spine. It is a great paper that follows the outcomes of over 400 patients for a mean time of 13 years with chronic low back pain who had some type of fusion surgery. The paper is quite detailed, although I did not read about what percentage of patients developed degeneration adjacent to the fusion so I assumed it must be 100%. This means if you opt for spinal fusion surgery, expect further degeneration of your spine at an adjacent level or several adjacent levels at some point in the future. The issue I have with this paper is it makes it appear that the onset of degeneration after spinal fusion does not correlate with new or an exacerbation of spine pain. While it is true that spinal degeneration does not necessarily correlate well with spine pain, it can and it does in the right instance or cases. I could run through several patients we have taken care of in the past 3 years who have had spinal fusions, have degeneration of the vertebrae at levels adjacent to the fusion, and have new spine pain as a result of this. It might not be surprising that most of these patients regret having surgery. A big factor as to improved outcomes is the surgeon. A surgeon who takes into account sagittal balance or posture when fusing the spine will have better outcomes than one who does not. It is likely that, since this research was done in Europe, their outcomes are better because of better techniques, it is my observation that Europeans are usually far and away ahead of us in terms of health care procedures and policies that improve patient outcomes. In my experience that it is very likely that at some point after a spinal fusion you will have new or an exacerbation of the original spine pain. If you do have new pain after surgery it is likely that either more surgery is in your future or an increase in drug use to manage the pain. The drugs most commonly being looked into to manage chronic pain are opioids. If you doubt what is going on in spine surgery research take a look at this search result. Most of these papers are due to researchers looking into ways to either manage new pain or develop procedures to reduce the likelihood of new pain after surgery. While we have had patients that required spine surgery, usually it is either due to a failure to make progress with our care or a severe injury, most of our patients are managed well without it. In fact we work with both a pain specialist and spine surgeon on our toughest cases which has helped us get great improvement in pain and function in even severe cases of spine pain. Spinal fusion surgery is not always your best first option to manage spine pain. Try chiropractic care first. Chiropractors like ourselves work with spine surgeons and pain specialists for your benefit so even if we cannot help you we have an avenue to the people who can.